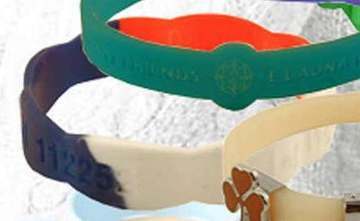 New and unique shapes of bulk custom imprinted silicone wristbands to inspire the wearers: chain-shaped silicone wristbands (silicone wristbands with links) and silicone wristbands with oval shapes: same price. Budget Prices in the USA and Canada for wholesale custom silicone wristbands with links . Free artwork design. We will send you a proof for your approval before production. 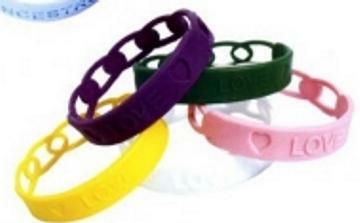 Multi-colored silicone wristbands: add $0.05 per wristband, per color. Wholesale Personalized Silicone Wristands Custom Debossed or Printed. Promotional, Very Inexpensive, with links, chain or oval shapes.